Study: plate tectonics modulates volcanic activity, which in turn modulates climate forcings | Watts Up With That? From Rice University comes this study that tries to equate an analog circuit component onto a climate forcing component. It is an interesting approach. The idea that plate tectonics serves to modulate episodic volcanic activity also makes sense. Study: Episodic purging of ‘carbonate capacitor’ drives long-term climate cycle, greenhouse-icehouse oscillations are a natural consequence of plate tectonics. What about all the other stuff, like ocean circulation disruption, wind patterns? Doesn’t sound like this is going to help improve the climate models. Most of the volcanoes recently that I recall seem to be continental type, Alaska, Kamchatka, Mt St Helen, Popocatepetl, others in Central and South America. On the face of it a very interesting idea. In the guts this is still blaming carbon dioxide for a great deal more than its share of atmospheric heat. Gravity and albedo have always been the major players in control of the Earth’s atmospheric temperatures. The use of the term “greenhouse” in the opening statement tells us this isn’t a serious work. The implication that the earth exists either as a frozen wasteland or a superheated jungle just doesn’t pan out in the stoma record. The belief that our atmospheric energy state can even be STABLE is a fallacy. We’re currently in an energy loss state even if the ground level temperatures haven’t gone down. I find it exceptionally hard to believe anything warmist that comes from NASA when they all know the atmosphere has been shrinking for more than a decade. I’d surmise that increasing the photo impedance of the 10m to 30m depth of the oceans by 10% would have ten times more effect on climate than a doubling of atmospheric CO2. I’d suggest a re-write of the theory that IGNORES carbon dioxide and explores the particulates and environmental response to the release of the other common chemical: sulfur. Dubious, perhaps. Measurements from recent volcanic events (over last 100 years) have not indicated huge quantities of CO2 burst emissions. Claims for large CO2 emissions from volcanic eruptions have been systematically scorned. Where’s the concrete? (Cooked limestone -> cement + CO2, cement + water = concrete :-). Svensmark’s (2012, “Evidence of nearby super novae affecting life on Earth” ) paper, available as ftp2.space.dtu.dk/pub/Svensmark/MNRAS_Svensmark2012.pdf, (free download) exposes a more credible mechanism and better matches. I asked the question about a year ago on this site how many volcanoes were they at any one time in the ocean. I suspected there were thousands down there we know nothing about. And if land based volcanoes can and do exert climate effects then the question to me was to what extent do ocean volcanism effect the ocean which in turn effects climate? This paper seems to shed some light on my question, however we have no idea of the full extent of ocean volcanism. How can we possible model without understanding the dynamism of the planet on which we live? They’re still blaming CO2. BAH! About every 100,000 years we have a REGULAR deep ice age followed by an interglacial. It has to be an orbital wobble/Milankovich causing change and being amplified by other factors such as oceanic cycles and oscillations. CO2 is simply a by-product of life-forms and ocean gassing occurring as a RESULT of the temp change some 800 years after the fact as found in ice cores and has virtually no input to temperature. This study obviously adheres to the CO2 influence to perpetuate the gravy train. Cosmic Ray Connection) tracking the Solar System’s orbit about the galactic centre also provides a good match with cause and effect (see his blog at sciencebits.com) to support Svensmark. At least they have the chain of causation in the right direction! thunderloon – I’d agree with downplaying CO2. From 1960s work I assisted as a student, I’ve followed an S based explanation at the back of my mind for a number of events. One at present is the divergence problem in dendro work. I’ve always felt, though feelings are trumped by data, that sulphur is more deficient in the global plant yield equation than CO2. Besides, when the children were at school we lived 1 km from a large smokestack pouring out SO2 from smelting copper sulphide, so it came to be like an old friend. There were detailed studies of the airborne distribution of SO2 from the large mine at Mt Isa Queensland. IIRC, the plume could be detected by then-available instruments for several hundred km. I have no idea who holds the data now, but it would be interesting to see if plant growth effect are visible on past satellite imagery, now that scrubbers are used. More to the point, at first blush, the same mechanism of tectonic wobbles does not rule out the episodic production of SO2, for it has roughly similar principles to CO2 as the authors propose. Blame CO2 because it gathers in the Grant Money! There may also be a difference in the overall amount of volcanic activity when continents are in more of a break- up configuration, rather then when they are more stable and volcanism is mostly about their margins at island arcs, which would also increase the greenhouse effect during such continental break-up periods. Also, it isn’t entirely clear what processes initiate broad scale upwelling under continents, such as at present under east Africa. Ice is the driver of the general climate conditions over long time-frames and eons. When ice is present, 50% to 80% of the sunlight is reflected back to space at the speed of light before it can have an impact on warming the planet. When ice is not present, only 5% to 30% of the sunlight is reflected on any particular place on Earth. This is the general condition which can change the most out of any other factor that influences our climate. It’s like 255 W/m2 of solar energy influencing our climate or 170 W/m2 influencing our climate. Its +/- 42 W/m2 of solar forcing. That is way more variation than the measly range that CO2 can deliver of +/- 8 W/m2 in geologic history. Why can’t the climate scientists do this math? They can’t get past the CO2 obsession, that’s why. What drives how much ice can build up? Take all the continents and put them at the equator. There is no ice in these conditions except for a very small amount of sea ice at the poles in the winter only. An average of 25% of the sunlight is reflected. Take all the continents and put them over the poles. The ice builds up 5 kms high and spreads out across all the land and ocean it can. Now, 50% of the sunlight is reflected. Take some continents and put them at the 75 degree latitude bands. Now you have big ice when the Milankovitch cycles are lined up. Winter snow only when the cycles are not lined up. Go back and look through the distribution of continents over time in geologic history – what continental drift has dealt to the Earth. Is this the pattern that has occurred? It matches pretty well. Not always, but very close. At least they accept that we are still in a glacial period. Too many times you hear supposed scientists claiming that just because there isn’t kilometre thick ice over Chicago or Scotland, that we are currently in an inter-glacial. It puts a whole different perspective on whether a deg.C of warming is good or bad. The paper in the above paper assesses plate tectonics (i.e. continental drift) as a contributor to climate change. I am wondering about the source of this idea which does not seem to be very plausible: it asserts that atmospheric CO2 variations trigger climate regime shifts, but this assertion is contradicted by paleo data. In March of 2012, the climate alarmist website SkS had their forums “hacked” and the contents posted online. It’s no dumber than some of the other myths floating around on the internet. Hmm, would be an interesting experiment if we worked this up into a technobabble, pseudo-credible explanation then tried to disseminate it through the denialosphere, tracking how quickly it spreads. Evil but interesting! Maybe it explains the CO2 levels but not the warming or cooling. Sophocles – the limestone gets absorbed into the magma, CO2 is volatile and the CaO can be crystallised as feldspar most likely in a continental volcanic. Carbonatites are carbonate rich igneous rocks where the Carbon content is high enough for it to be deposited as carbonate in the rock. These usually contain a high proportion of rare earths and are likely to be the product of magma fractionation rather than carbonate rich sources. OK so what caused the global marine anoxic event? This sort of study is only of feint interest in the absence of a credible explanation of how CO2 can possibly add to the energy balance. The researchers rely on a first principle which has no visible signs of support. These people still worship at the CO2 altar. I too was disappointed at the propping up of the CO2 driven climate. According to the ice cores, CO2 never gets much above 300ppm. We are now 33% above that with no effect. Why does it stop getting warmer when CO2 is high, if CO2 is doing the warming? The best explanation I’ve heard is that CO2 replaces water, a much more effective GHG, and thus reduces the overall warming. Mike Bromley the Canucklehead back in Kurdistan but actually in Switzerland says: At least they have the chain of causation in the right direction! Comment correct, theory passes for first link in chain: CO2 didn’t cause vulcanism. richardscourtney: …it asserts that atmospheric CO2 variations trigger climate regime shifts, but this assertion is contradicted by paleo data. Comment again correct, theory fails for second link: Warming precedes CO2 rise. I like the idea of looking at the last 500 million years to confirm the response of the Earth’s climate to an increase in forcing. Let us agree some facts first. The warmists always like to state their argument in the form of, increased atmospheric CO2 = increased warmth. 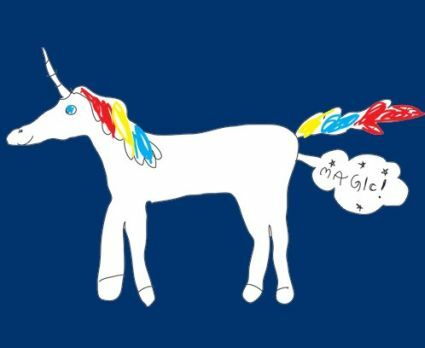 However, this is not an accurate representation of the science. What they should say, for accuracy, is that…… ‘Increased CO2 in the atmosphere, leads to an increase in Radiative Forcing on the Earth and an increase in Radiative Forcing leads to increased warming on the Earth’. What is is true though, is that only the first part of that latter statement is a proven fact. The ‘Greenhouse Effect’ is not a separate forcing, it acts as an amplifier of the radiative forcing effect of the Sun. Take that away and you are not left with the ‘Greenhouse Effect’ forcing you are left with nothing. So let us agree to use the correct terminology in our agreed facts and talk about the increased Radiative Forcing (RF) caused by the increased CO2. Warmists will say why not jump straight to increased CO2 = increased warmth, as physics demand that this must happen if we push additional energy, via increased RF, into a system and it makes it simpler to understand. I am sure a lot of the cleverer warmist scientists like to do this deliberately, because it deflects attention away from a rather obvious truth, that we will come to later. So, is it obvious in physics, that applying increased heat energy to a system, will lead to a long term increase in that systems temperature? Well in a non-dynamic system that is absolutely true. If I stick one end of a bar of metal in hot water, the other end will heat up after a time. If I stick the feet of a cadaver in hot water the head will heat up after a time. However, if I stick the feet of a living person in the hot water what happens to the head now? Oops, what has happened to the physics? Nothing of course but in a dynamic system, like the human body, the input of heat at one point may trigger dynamic processes that cause no long term heating in the system as a whole. Indeed it is perfectly possible for the human to end up cooler for a time. It all depends on the strength of the triggered feedback processes and whether they are negative or not. So we can all agree that increasing energy into one part of a dynamic system does not necessarily lead, automatically, to a general heating of that system. Now the Earth’s climate system is a dynamic one, we can all agree on that, changing one process will often lead to a change in a connected process which may be a positive or negative effect. So what empirical evidence is there that increasing Radiative Forcing long term on the Earth causes it to warm long term? Err… that would be none then! We do, however, have irrefutable evidence that the Earth does NOT warm long term in the face of increased RF. We actually have a good record of the effect of an increase in Radiative Forcing on the Earth because of the Suns behavior. The Sun has been increasing its output and therefore the RF on the Earth, by about 1% every 100 million years and will continue to do so for billions of years. You could look at the ‘Faint Sun Paradox for starters which shows that three billion years ago liquid water was present on the Earth meaning that temperatures must have been similar to, or warmer than, today’s. It could not have been much colder. So the Earth has not warmed in the face of a 30% increase in RF for 3000 million years. However I do not use these facts, remarkable as they are, as evidence that the Earth does not warm in the face of increased RF, as the Earth was totally different then, different atmosphere, virtually no life etc. No, instead let us look at the last 500 million years. If we went back then it would look familiar. The atmosphere was like today’s, life had colonised and exploded across the land, the carbon cycle was established, plate tectonics were in full operation etc. We would notice one thing different however. 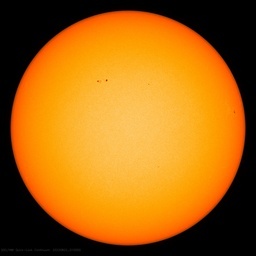 Well since that time the Sun has increased its RF on the Earth by about 5%, (equivalent to about five doublings of CO2) a very significant sum, amounting to about 65 WM2 at the top of the atmosphere. So what would we notice that was different back then? Well it was hotter then. A lot hotter! The global temperature being about 22C compared to today’s 14C. Since that time there have been about three halvings of CO2 in the atmosphere, leaving a net increase of about two doublings, about 27Wm2 at the TOA. So for hundreds of millions of years the Earth has been cooling long term in the face of significantly increased RF. This is a fact, not conjecture, real empirical, undeniable evidence. So the warmists theory, correctly stated as………….. ‘increasing the RF on the Earth, by emitting more CO2, will automatically lead to a warmer Earth’, is falsified. Fact! …..I’d surmise that increasing the photo impedance of the 10m to 30m depth of the oceans by 10% would have ten times more effect on climate than a doubling of atmospheric CO2. You beat me to it. My thought exactly. Haven’t these guys heard of the Laki volcanic eruption in 1783 that started the French revolution or the more recent volcanic eruption at Eyjafjallajökull? It sure wasn’t the CO2 that caused all the problems! They are also missing Magnetic Reversals Linked to Massive Volcanism. …Scientists at the University of Liverpool have discovered that variations in the long-term reversal rate of the Earth’s magnetic field may be caused by changes in heat flow from the Earth’s core. The team conjectures that this big drop in the frequency of reversals may also be related to a similar decrease in the number of ‘large igneous provinces’ (LIPs)* or concentrated outpourings of magma from the Earth’s core, 50 million years later….. I asked the question about a year ago on this site how many volcanoes were they at any one time in the ocean…. In other words they have no real idea. This whole glacial cycle thing has the earmarks of a positive feedback cycle. Tens of thousands of years of cold and then tomorrow it’s warm. I suggest this implicates volcanism as in this “work” although through a different mechanism and that is ocean floor shrinkage. Building an icecap means increased freeze/thaw action which generates both fresh water and cold dense brine which recharges the reservoir of cold deep ocean water. The interface between CDOW and surface water rises causing the ocean floor to shrink in certain regions opening sutures in the ocean floor rift zones with consequent volcanism. This would involve long time delays but once it got started suspended volcanic dust would cause pronounced cooling and also lay the foundation for an eventual recovery as once the dirty snow is exposed albedo would decrease and the climate would snap over into the warming phase once again. The signs of a cooling would be major volcanism in the northern regions of major ocean basins; Kamchatka/Alaska and Iceland. Later activity would move progressively toward the equator. Then you provide several links. There is an additional important point which is not often recognised. Undersea volcanism may alter atmospheric CO2 by emission of sulphur (n.b. emission of sulphur and NOT CO2). Sulphur ions from undersea volcanoes may travel with the thermohaline circulation until reaching the ocean surface layer some time later (which may be minutes, years or centuries later). These additional sulphur ions in the ocean surface layer will reduce the pH of the layer with resulting reduction to the solubility of CO2 in the layer. Importantly, this reduction to CO2 solubility alters the equilibrium concentrations of CO2 in the layer and the air. A reduction to ocean surface layer pH of 0.1 would be far too small to be detectable but would be sufficient to have caused all the rise of atmospheric CO2 concentration since the industrial revolution. I have only been able to read the abstract of the paper by Cin-Ty Lee et al. but it makes no mention of the possibility of ocean surface layer pH modulation from volcanic sulphur possibly affecting atmospheric CO2 concentration. This seems to be a strange omission from the paper which assumes volcanism increased atmospheric CO2 concentration by direct addition of CO2 to the air. There has been a grand total of three snowcone episodes in the last 500m years, one of which we live in today. The present one did NOT start 50m years ago in the Eocene. Snowcone episodes in billions of years ago: 2, .8, .4, .3. .003. Not seeing a cycle here…oh, I know, they are emergent CO2 phenomena. Aside to the Extinction Protocol: The north magnetic pole seems to be dividing and weakening. This may have something to do with persistant stratospheric and surface temperature anomalies in the Arctic, but the evidence of spreading rates from seafloor isochrons and other mafic vulcanism in Large Igneous Provinces indicates that the highest production rates we are aware of conicide with the Long Cretaceous Normal, the longest known period without a reversal. We associate stability with a strong magnetic field. “I thought, ‘Wow!’” Lee recalled. “I know coincidence doesn’t mean causality, but it certainly got me thinking. At least he is smart enough to know this. if it was extra CO2 then it didn’t cause runaway, catastrophic warming. Why would that be? Yes, sulphur has been deficient since scrubbing from flue gas. I recall my surprise – many years ago, following all the acid rain hype – when told sulphur was now being added to agricultural fertilizers. It would seem that it is more than just a trace nutrient, and prior to the industrial revolution would most likely have been seriously deficient. Would be interesting to look for volcanoes in the pre-industrial dendro- record? and the longer term more intense Arctic ice summer melt from the ash deposits, regardless of the volcanic eruption timing. So, wait, the glaciations end 800 years before the volcanoes pump CO2 in the air, right? Maybe glaciers have highly developed senses. They feel that the carbon capacitor is charged up and head for the hills. Makes sense. Bring the fine researchers more taxpayer money. What, the treasury’s empty? Well, PRINT them more money, then. 1) @ Richard Courtney, Plate tectonics is not synonymous of continental drift as lithospheric plates -continental and oceanic ones- include an upper part of the upper mantle at their base (below the Moho but above the Low Velocity Zone or Asthenosphere) while Wegener was only talking about SiAl floating on SiMa, i.e continents floating over mantle. >Too many times you hear supposed scientists claiming that just because there isn’t kilometre thick ice over Chicago or Scotland, that we are currently in an inter-glacial. Well, we are in an inter-glacial, within a larger “icehouse” pattern. During inter-glacial periods, temperatures rise, until they sudenly turn around and fall back into an ice age. Probably the emplacement of the Caribbean LIP (Large Igneous Province). The amount of CO2 outgassed by a LIP is several times larger than that of all other volcanos on Earth. Continental margin volcanism is small change in comparison. I accept and agree your pedantic point addressed to me at February 8, 2013 at 7:58 am. However, in context I see no reason to revoke my simplification. “The paper in the above paper assesses plate tectonics (i.e. continental drift) as a contributor to climate change. I am wondering about the source of this idea which does not seem to be very plausible: it asserts that atmospheric CO2 variations trigger climate regime shifts, but this assertion is contradicted by paleo data. What you write above is chilling and very disturbing. However, the link you provided does not lead to the 3/7/12 post you quoted (or at least I can’t find it, somehow). Is this hacker reliable? You did well until the last 2 words. 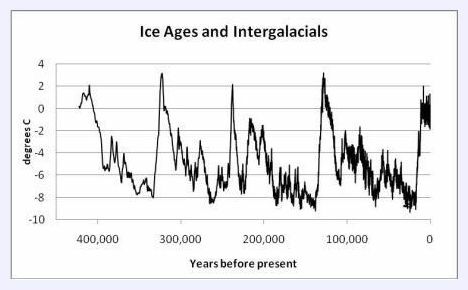 We are in an interglacial and in an ice age. We are in an ice age whenever there is ice at the poles. vukcevic says: And here are some examples of correlation of geological activity and climatic indices. oscillations in the Earth’s field (green line) amount to ~20% of the 1880-1990 change in the GMF. multiplied many times over. I don’t mean to be an alarmist. Here’s another graphic that illustrates how volcanism tends to take place during cold periods. I think it may be more likely the other way around. The long term solar variation influences the volcanism and plate tectonics. As others have pointed out, this paper is complete nonsense. It strives to keep the ‘CO2 as climate driver’ hypothesis alive, but (a) volcanoes by a very large factor produce far too little CO2, and even if they did produce a lot then (b) excess atmospheric CO2 doesn’t last long enough, (c) excess oceanic CO2 doesn’t last long enough [it quickly converts chemically and biologically and ends up on the ocean floor], and (d) Earth’s history shows that it didn’t happen. re (b) : The timeframe here is 10’s to 100’s of millions of years. Atmospheric CO2 is gone in decades, or you could accept the IPCC’s “centuries”, and even if the THC brings it round again a few times that’s only a cycle of a few hundred years. (1) Volcanic activity has been going on since the Earth originated and there is no evidence that it is any different today than at other times in the Earth’s history. Every geologic period has its share of volcanic events. (2) All volcanoes give off large amounts of CO2, which doesn’t come from melted limestone. Volcanic eruptions occur thru narrow conduits that have very limited surface area that could potentially interact with limestone. If large amounts of limestone were to be ejected by volcanoes we would expect to see lava and ash full of limestone fragments–we don’t. (3) Volcanic eruptions are short-lived geologic events that only affect weather for a year or so and thus are incapable of sustaining long-term climate change. (4) Plate tectonic processes are slow, climate changes are abrupt. (5) CO2 as a cause of global warming has yet to be proven. If fact, all the evidence to date hows that it has only a miniscule effect on climate. CO2 always follows climatic events, rather than precluding them, even on short time scales. There is a lot of scientific evidence showing warming followed by increased atmospheric CO2 and none the other way around. CO2 accounts for only about 3% of the greenhouse effect (water makes up about 95%) and data shows a slight decline in atmospheric water vapor in the past 65 years while CO2 was rising. There are lots of other reasons why this hypthesis isn’t credible, but you get the idea. The link I provided is to the blog of Tom Nelson whom I have found to be reliable. The link states that the leak was ‘sealed’ and the file of the ‘hacker’ is no longer available. I have no reason to doubt the quotation. I note that Geoff Chambers has posted in this thread and has also made the same quotation. Assuming he did not copy it from my post on WUWT, perhaps he can help track down an original source. I was going to add this thought for a open thread weekend but for my tuppence woth of insight. One assumption is that the Earths’ atmosphere is of a consistent thickness and density. We know that the Earth has no free Helium due to the lightness of Helium and its escape velocity when energtically excited. The thermal excitation also applies to nitrogen, oxygen, argon , etc.Without replenishment eventually Earth will lose its atmosphere. The main source of replenishment is outgassing from volcanoes. Thus volcanic activity is a major factor in the amount of atmosphere. A quiet period will reduce in the amount of atmosphere and cooling temeperatures. High volcanic activity will increase the thickness of the atmosphere and the overall temperature. And volcanic activity is related to continenetal drift. Thank you, Richard. This really puts this whole paper into a very different perspective. Worth far more than a tuppence. Back in the seventies (was that the Paleocene?) we used to talk about the “human volcano”. We should still be talking about it because we are a pretty respectable volcano. Never checked the calcs but heard it said we are on a par with the Siberian Traps. Wouldn’t it be hilarious if our major contribution to warming the planet was increasing the mass of the atmosphere? All of the other changes are meaningful, from ocean circulation, wind patterns, volcanic activity, non-CO2 volcanic emissions, and albedo changes and effectiveness as land masses change latitude, BUT greenhouse anything is meaningless. No gas of any kind at any concentration can warm the climate. The thermodynamics simply does not work. They claim that CO2 is warming the upper troposphere (at -17 Deg C) which then radiates IR to the surface (at 15 deg C) which then warms the lower troposphere. A cold body simply cannot warm a warmer body. Total failure of their model. When the occupied energy levels of the cold body radiate appropriate to their temperature, the warmer body, with energy levels filled to its warmer temperature, will simply reflect the radiation as the energy levels equal to the colder radiation at thoroughly occupied. The colder radiation is rejected. The IR radiation is sent back upwards and the weak IR absorption of the CO2 it passes through will have no meaningful effect. The greenhouse effect they claim totally ignores atmospheric convection which is responsible for up to 85% of heat transfer to altitude—real glass greenhouses work entirely by preventing convectional heat loss. This is why Trenberth has so much trouble with his missing heat that he likes to assume is lurking in the ocean depths waiting to jump out and rapidly warm the climate. Just the assertion that a trace gas like CO2, let alone a gas with such a pathetic IR absorption spectrum like CO2, can warm the climate is laughable. Furthermore, when IR is absorbed by a gas molecule of any kind, it will be re-radiated immediately and in the same direction as it entered, just as any EM radiation passes through air. They claim that the upper troposphere is the site of warming as, at that altitude, radiation propagation is less effective and Raleigh scattering is greater. It is thus laughable that this thinner part of the atmosphere, with even thinner CO2, is supposed to be warming the planet. It beggars the imagination. The “alleged” “radiative greenhouse effect” simply delays some energy flowing as IR EM radiation by causing it to make several passes through the system at the speed of light. It’s similar in some respects to the reflections at the end of an improperly terminated electrical transmission line, or the sound echo from a babbling brook in a narrow canyon. Neither effect adds any energy to the system. These effects just delay energy propagation, or concentrate energy into a more compact volume. A multi layer optical interference filter will indeed (when properly designed) cause more energy to “stay here” (i.e. cause less reflection of EM radiation at a surface) but it requires constructive and destructive interference of EM radiation to function. While I’m open to the possibility that IR EM radiation is interfering at the atmosphere / Earth surface interface and causing a lower reflectance (albedo in climate science terms) I am highly doubtful that that is the case. This will lead to ‘Global Warming Forces Plate Tectonics’ and other nonsense. Correct me if I’m wrong (and I can’t find the graph at the moment) but doesn’t CO2 increase/decrease lag behind temp increase/decrease by about 800 years, so this seems to be putting the cart before the horse. Or am I missing something? Tectonics and volcanic activity are interconnected. Volcanoes produce more CO2 than we do thank goodness since plants need CO2 and we all need plants. Volcanic ash causes cold. Cold causes volcanos. Volcanos emit ash. No violation of causality. Volcanic ash causes cold. Cold causes volcanos. First part right.Second part wrong. 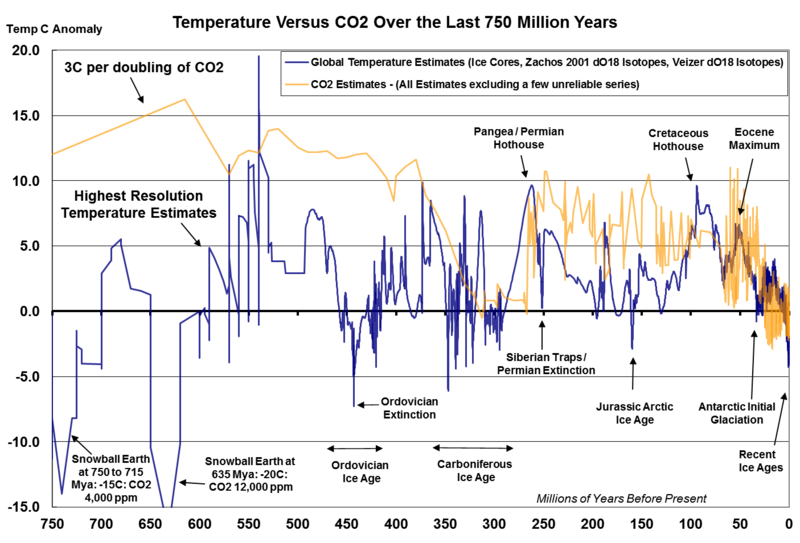 Here’s a look at Temperatures and CO2 over the last 750 Million Years. Its got the last two Snowball Earths, the Cambrian warm period (which looks hotter than I think we’ve thought of before, the hottest in fact over the period), the Ordovician extinction/ice age, the Carboniferous ice age, Pangea hothouse, Permian Extinction, Jurassic ice age (which few people know about), Carbonifeous hothouse (when sea level was 265 metres higher than today), the Eocene Maximum (which is not that maximum compared to other hothouses), the initial Antarctic glaciation (actually the fifth time Antarctica was under ice in this timeline), and the recent ice ages and CO2 at 3.0C per doubling (which is clearly too high for almost all of the record – something else is driving this climate – ours that is). There is no reason that the Milankovich cycles AND repeating tectonic perturbations cannot be both reconciled with ice ages. We would have to find a reason that the Earth were subject to stresses that caused the crust to move. The bigger trigger that occurs chronologically as Milankovich cycles. A gravitational force, I suppose. Something that drags in an accelerating manner the solar system off course. That would cause the interior of our planet to “slosh around” as we circled the sun, in the same way that our brains slosh back forth in our skull as we accelerate around a curve in a racetrack. Anyone for a black hole or two drifting around the perimeters of our galaxy? At the same time the CO2 lobby got powerful the plate tectonics people had virtually this same theory except for the reversal of cause and effect. I think few people will fail to remember the climate scientists ridiculing the idea of volcanic activity being even relevant.